Tapping is often called a tool to support you in living your best life. In the Amazon book review section alone, you can read hundreds of testimonials where people have used it to clear emotional conflict in their mind and body. It works so well because all of your problems originate in the energy system. Whenever there is a block in your energy system, you also experience a physical and mental block. When you tap on the meridian points, you stimulate the acupressure points which calms down the center of the brain – which is why you feel relief from stress. You don’t need any special supplies to do Tapping. You can do it while standing up, sitting down, or even lying down, and you only need your two fingers to start feeling the benefits straight away. This is why many people love this simple technique: because it is easy to do and takes only a few minutes (longer if the issue you’re working on is more serious). Most of all, it is a drug free method of relieving stress from everyday life. Beginners often ask if you have to tap on one side of your body or the other. You can tap on either side, alternate sides (changing right and left), or both sides at once. Depending on the length of the Tapping, I personally tap on my right side first, then my left side, and then on both sides, and then repeat again if necessary. 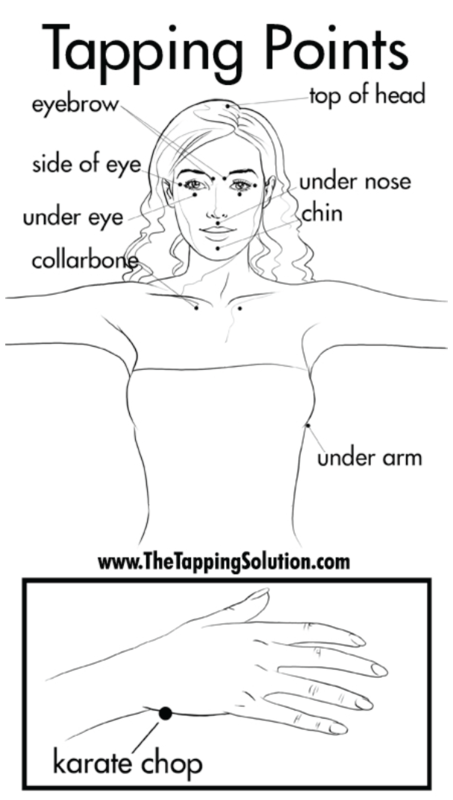 To help you get the most out of your Tapping sessions, here are 4 tips from Carol Look. Carol is a certified EFT practitioner and is a regular featured expert in the annual Tapping World Summit. I tried teaching Tapping to a friend of mine once. He couldn’t get it done right because he avoided the real deeper issue he was having. He was very reluctant to admit what he was going through, which in turn prohibited him from feeling the release from Tapping. Be honest with yourself. Choose a very clear and vivid target that is bothering you right now, whether the pain is on your body or inside your head. The more focused you are, the better results you will get. I still often forget to do this myself. As a general rule of science and medicine, you have to measure your progress as you go along. Before you start to tap, ask yourself, “How upset am I about this?”. Give it a value of 1-10: 1 means you barely feel anything about it, 10 means you are in excruciating pain about it. By giving it a value, you can measure how your pain has reduced after Tapping. A setup statement is simply saying what your problem is, and then accepting it. It’s important to note that you have to use an honest and specific setup statement. You can use a “generic” statement, but it will reduce the effectiveness. We live in such a politically correct society that it makes us afraid to say what is really on our minds, which in turn also effects how much healing we can enjoy. Don’t be afraid; say the truth. One good example is when a person who wants to lose weight. Instead of saying, “Even though I have this extra weight on me …”, she can say, “Even though I have this flabby fat that makes me feel disgusting …”. Sure, it sounds harsh, but it’s the truth that needs to be expressed in order to be healed. Start tapping on your meridian points while repeating your setup statement. Don’t worry so much about whether what you say is correct or not. As long as what you say is honest to yourself and identifies the real deep pain you are feeling, then you are doing everything right. Are you feeling the benefits already? Tapping is great because it can work on its own, or you can use it combined with modern medicine. Tapping is not meant to substitute medical procedures – it’s meant to supplement the healing process by approaching it from an emotional angle. Often times, when the emotional aspect of an illness is healed, so is the physical aspect. You might already start to feel results after 1 round of Tapping. If you haven’t, don’t worry about it – just keep doing it until what you feel drops to a number so low (on a scale of 1-10). Tapping is so easy and powerful that you might feel overwhelmed as what to do or what to work on first. If you need a simple guide to help you get familiar with Tapping and all that it can do for you, then sign up for the free 10-day annual Tapping World Summit. We are grateful to be of service and bring you content free of charge. In order to do this, please note that when you click links and purchase items, in most (not all) cases we will receive a referral commission. Your support in purchasing through these links enables us to empower more people worldwide to live healthy with less worry and less hassle. Thank you!